The Sony Cyber-shot DSC-HX20V, the latest flagship pocket compact in its High Performance range offers an all-in-one solution for travellers who don't want to pack a DSLR or compact system camera, yet still require choice when shooting stills and video. Travel zoom cameras have quickly become something of a saviour of the photographic industry. Their broad focal ranges yet pocket-sized proportions distance and differentiate the compacts from the smartphone threat. With a solid-feeling metal build, stereo microphones, integral GPS, top-of-the-range G series lens, plus serious black finish, it certainly resembles a premium camera. A high-ish price tag of £349 in the UK and $398 in the US pitches the Sony HX20V against the class-leading Panasonic Lumix TZ30 - both cameras featuring a 20x optical zoom range - as well as high-powered bridge cameras such as the 30x zoom Fuji HS30. On the Sony Cyber-shot HX20V, the core focal range is equivalent to 25-500mm on a 35mm camera, and the camera witnesses the debut of what Sony calls its Advanced Aspherical (AA) lens design, the purpose of which is of course to deliver a big zoom in a fairly small body. The camera's dimensions measure 106.6 x 61.9 x 34.6mm, with a leather effect rubber grip plus Optical SteadyShot stabilisation helping to avoid blur when shooting handheld at maximum telephoto, and effectively so, as it happens. Value-added features such as the auto stitching Sweep Panorama extend the scope for how much information can be squeezed into your frame. The Sony Cyber-shot HX20V finds room for the same 18.2 megapixel 1/2.3-type Exmor R CMOS sensor used by the Sony HX200V, while avoiding its sibling's mini DSLR bulk and being cheaper with it. Also onboard is its image enhancing Pixel Super Resolution technology, helping to reduce if not wholly prevent the blocky appearance of conventional digital zooms. In doing so the Sony HX20V looks to deliver what many could consider a very fair compromise of small size, yet big imaging performance. That's if potential purchasers can justify paying £150/$200 more than less flashy but still fully featured travel zooms such as the 18x zoom Samsung WB150F, also with GPS. 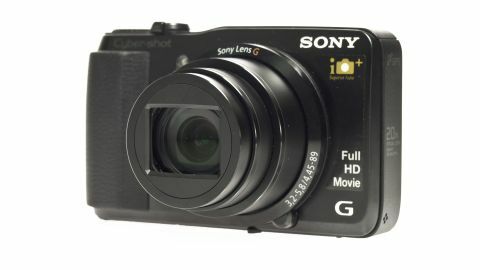 Lending the Sony Cyber-shot HX20V a more rarefied air, however, are DSLR-style features such as a software-boosted maximum sensitivity of ISO 12800 (against the Samsung's ISO 3200), high speed Bionz processor, and AF timings of 0.13 seconds in daylight. This latest high-powered Sony Cyber-shot certainly looks the part and reads as capable on paper, but how does it prove in practice?